When I first started in therapy, my therapist had a flat basket of small rocks and stones in her waiting room. I thought this was awesome because I was a therapist (in training) who also had a flat basket of small rocks and stones in MY waiting room. I took this as a sign of validation (Look! I am a cool therapist too!) And the similarity and familiarity gave me the hope that I could feel ‘at home’ there. The rocks in the flat basket in my office were stones I had picked up from the coast of Maine—all different shapes and colors—most were different colors of granite and many with a big stripe of white in the middle—rocks that were called ‘lucky rocks’ by my nieces and nephews. The rocks were something that the teenagers who came to see me could take with them if they wished—reminders of the work that they were doing or talismans to give them strength. The stones in the flat basket in my therapist’s office were more polished but there was one larger flat rock which I quickly decided use as the base of a small cairn. Now, cairns are traditionally piles of large rocks usually placed along trails as trail markers. I saw my first cairns hiking in the White Mountains when I was a teenager. On the first day, in the bright sunlight of a summer day the cairns looked totally unnecessary—the trail ahead was obvious; it looked like there was no need of a giant pile of stones every 20 yards to mark the way. But when I woke up the next day to fog and rain—and I couldn’t see more than 25 feet in front of me—then the purpose of the cairns shines bright and clear—they are beacons. The cairns were the only possible way forward. Our group traveled for two whole days above the tree line on that trip only ever seeing the way to the next cairn. And that summer I learned this amazing lesson that you don’t have to be able to see the whole trail ahead of you in order to keep going—you just need to be able to see to the next cairn. In my therapist’s office in those early first few months I would pick up a rock and place it on the flat rock. Then I would put one more small rock on top, and would sit down in the waiting room chair, pleased with my effort and my miniature cairn. I never said anything to my therapist about them. Actually, I barely said anything to my therapist about anything. Because in the beginning, I found it really hard to talk. As someone who had failed ‘self-control’ in second grade because I couldn’t stop talking—I was stunned to find myself unable to find words—any words at all. As Bessel van der Kolk says, ‘it takes enormous trust and courage to allow yourself to remember.’ And what I found was that it takes an enormous amount of bravery, effort and patience to find the words that may help you remember. In the beginning, I didn’t have words. But I had those stones. And with those stones I built cairns to find the path forward. The cairns in the basket of rocks were a source of play—it gave me the feeling that I could move and not feel stuck-- the way I felt stuck with language. Sometimes I would come in to the waiting room and the stones would have been moved. It felt like a conversation—a back and forth— without any of the pressure to know words. It felt like the only conversation I could have at the time—a conversation in stones, a conversation in play. Over time, the play with the stones in the basket made its way from the waiting room to the office—with metaphor, with poetry, with art. And all of these cairns slowly helped me find my way forward, to words and to myself. I had mostly forgotten these small cairns, my training ground for words until this weekend when I came across a whole beach of little cairns on Peak’s Island in Maine. Maine has a rocky coast, and along one whole stretch of one of the beaches there were hundreds of little, one to two foot high, cairns made of beach rocks. Cairns as art, or practice, or devotion. Looking out at them I remembered how powerful the cairns in the Whites and the cairns in the office had been. And before I left the island, I added my small cairn to the beach too, maybe as a way of saying thank you. I was so grateful for the reminder of cairns and how they make it possible to stay on a path when you can’t quite see where you are going. I needed this reminder so badly right now as I am working on two difficult projects—one in the outside world and one in my inner world—and both of them are going to take a while. They are long expeditions. And both of them, for better or worse, are currently shrouded in fog. The whole path isn’t visible, the way forward isn’t clear. These journeys can feel long and lonely, but it is important to remember that cairns aren’t an individual effort. Traditionally in Scotland, hikers carried small stones up the mountain and placed them on the cairn on top—collectively helping the markers become ever larger. On the famous pilgrimage route, the Camino de Santiago, the pilgrims carry stones from their homes to place on the cairn at Cruz de Fierro. This cairn marks the pilgrim’s way because of the thousands who have gone before. 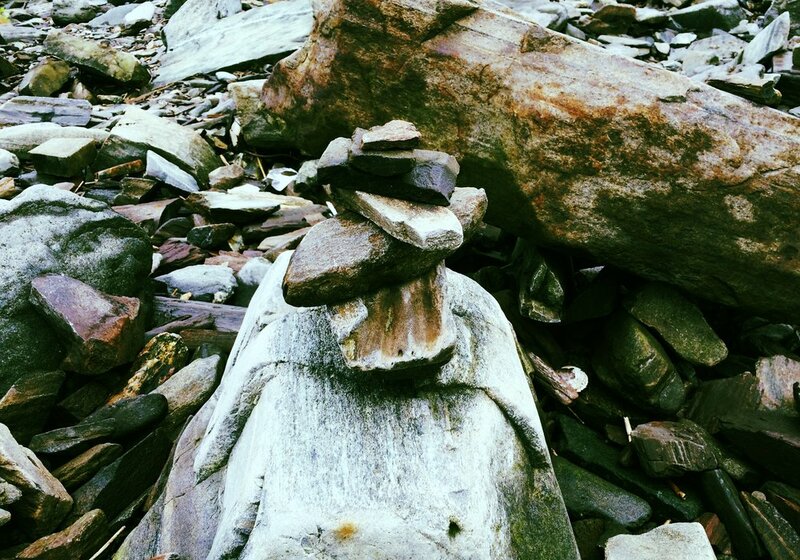 And in a small way, the many cairns I saw all along the beach on Peak’s Island also marked a way forward. They were gifts left by others—tiny lights shining reminding me of what I once knew and needed to learn again. These small cairns came during a weekend retreat with old, dear friends who each shared their struggles and their stories, sharing that one small stone that helped each of us find our way forward. Cairns are made by all those who are making their way along the path—and are able to drop one small stone on the cairn to make the way more clear for the others who might follow. And it is one of the true gifts of healing and learning and growth—that each of us can, as we make our way forward on our own paths-- we can leave a stone, or a word, or a poem, or whatever we have on the cairns as we pass them. The gift is, that in struggling along our own trail, we become the trail makers. Each of us makes it possible for the next person coming along, the next person who can’t see a way forward, to make it to the next cairn. And the next one. Making their journey forward possible. And a special thank you to my salon sisters: Jane, Sarah, Alison, Cheryl and Laura. Older PostHave an Awkward Day!